Have you heard of the “massaged kale salad” phenomenon? I love kale, but out of sheer aversion to the terminology of eating anything that has been “massaged,” it took me months to finally try one. In fact, I kind of did it by accident because (sneaky, sneaky!) the word “massaged” wasn’t in the title of the recipe I was making. It was in the directions. And I know, I know, you’re supposed to look over the whole recipe before you begin cooking. Careful reading is apparently a challenge for me; it’s a miracle if I can get all my grocery shopping done in a single trip because I get home and am inevitably missing at least one ingredient that I didn’t realize I needed. Anyway, what I learned was that massaging kale—can we actually call it “rubbing some olive oil into your kale” from now on? 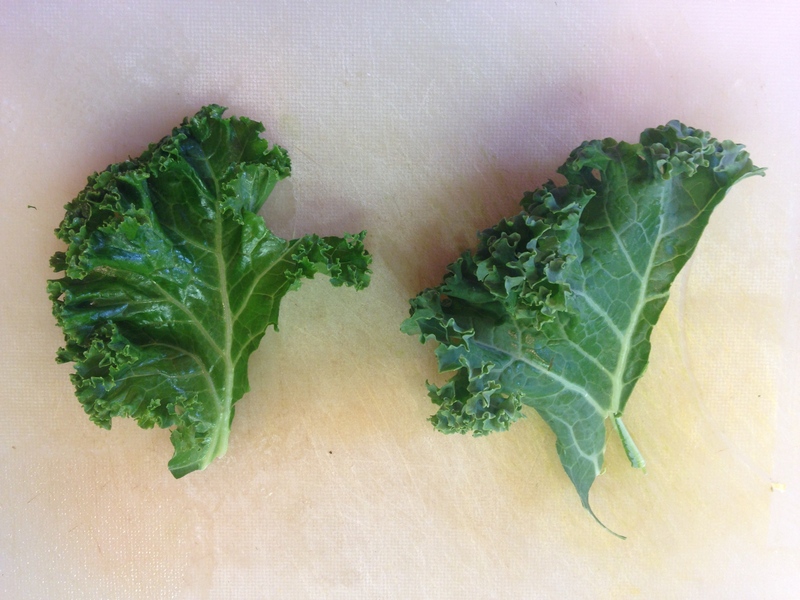 Ok, what I learned is that rubbing some olive oil into your kale is the equivalent of blanching asparagus or green beans: it takes the raw edge out, but still leaves you with lots of flavor and crunch. And, bonus!, also like blanching, it makes your kale a very pretty, vibrant shade of green. So, after jumping on the massaged kale bandwagon (and trying kabocha squash for the first time, which (sorry, butternut) has become my new favorite winter squash), I fell in love with this salad by Gena Hamshaw from food52 and had it every day for lunch for about 2 weeks. On the left: rubbed. On the right: raw. Which brings me to the lamb burger. Apparently, when I eat a salad for lunch every day for 2 weeks, even if it is delicious, I eventually crave something that is the opposite of a salad. So, this burger was the product of really wanting something meaty and really not wanting to take a trip to the store. 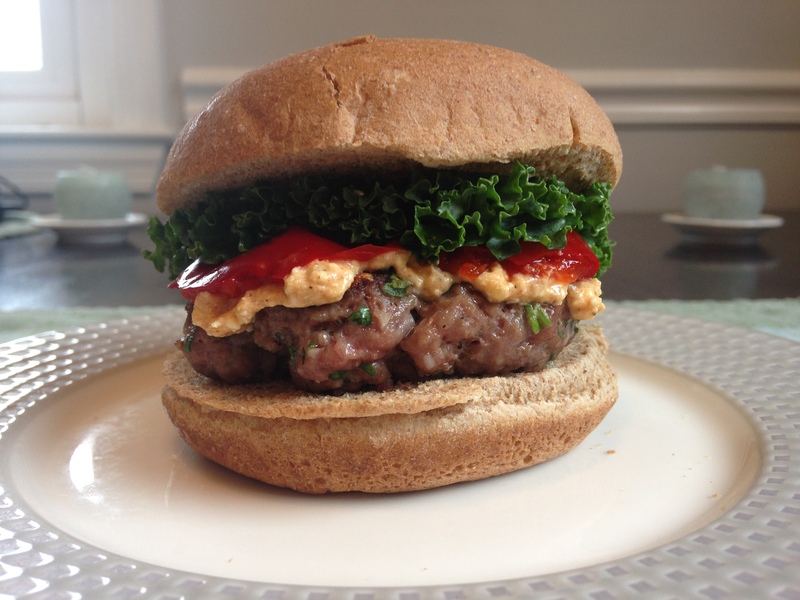 I ransacked the kitchen and came up with a chunk of feta, some frozen ground lamb, and some frozen hamburgers buns. The produce drawer was pretty bare, but there was a jar of cherry peppers hanging out in the kitchen door. We had no lettuce, so I used kale, and—you know what’s coming—massaged some lamb drippings into it. I tried making a lemon-yogurt sauce with the feta, but it was really tart and not what I was looking for. I scrapped that and went a different route, adding sweet and hot paprika to the feta to complement the sweet and hot cherry peppers. If it weren’t freezing cold, I would have probably grilled these outside, but I’m a wimp about winter weather, so I cooked them in a ridged grill pan on the stove top. I liked that the ridges allowed the fat to drip off some because the lamb was pretty fatty, but my husband said he might have liked it better in a cast iron pan. Note: I used 6 oz. of lamb because that was what we had in the freezer. I would probably bump it up to 8 oz. (so, 1/4 pound per serving) next time. And maybe add a thin slice of red onion to the toppings. Crumble the feta, and use a fork to mash it up with the mayonnaise, garlic, and both paprikas. Add salt and pepper to taste. Combine all of the ingredients and form into 2 patties. Preheat a grill pan or cast iron skillet to medium-high heat and brush with a little vegetable oil. Cook the patties until desired doneness, about 4 minutes per side for medium-rare. If you want toasted buns (I did), pop them in the oven or toaster while the burgers are cooking. After the burgers are done, remove the pan from the heat and wait a little bit so you don’t burn yourself! then rub some of the lamb drippings into each kale leaf so that they soften up a little bit and get nice and shiny. Top each burger with half of the spread, one or two cherry peppers, and a kale leaf.